Guiseley goalscorer Scott Smith, left. 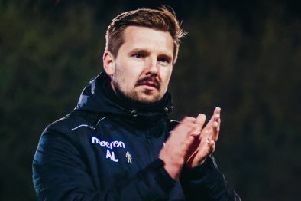 Guiseley gained another valuable point on the road against a side aiming for Conference North promotion after drawing 1-1 at AFC Telford United. After last night’s draw, Guiseley joint-manager Russ O’Neill said: “We’ve have had two tough games in recent days and gained something from both of them, we could have won it tonight in the end as well. After the impressive point gained against promotion-chasing Stockport County at the weekend, the Lions went up against another side in the play-off places, but a team who had lost their previous game away at Brackley Town. Before kick-off there was a minute’s applause for the late England goalkeeper Gordon Banks, with the World Cup-winning Yorkshireman, who had also managed Telford, being remembered. The hosts made a bright start and with just over 10 minutes gone took the lead, when a low-drive from Daniel Udoh left Guiseley keeper Marcus Dewhurst with no chance, as his shot nestled into the bottom corner of the net. Telford controlled large periods of the first-half and could have doubled their advantage, when a cross found Ellis Deeney but his header was straight at Dewhurst. The Lions showed plenty of fight and nearly got level before the break, as Andy Halls saw a long-range effort go just past the post. Just after the start of the second-half, Guiseley drew level, when a long Niall Heaton throw wasn’t dealt with and Scott Smith was on hand to head in from a few yards out. The game really opened up and Lions pair Kayode Odejayi and Rowan Liburd both had good chances saved. Telford tried to get back in the ascendancy but due to the work-rate by the Guiseley side they couldn’t. In fact Liburd nearly won it for the visitors, as he hit a strike from just outside the area that took a deflection and clipped the outside of the post. The Lions play FC United of Manchester next in a crucial six-pointer at the bottom of the table.